This charrette site is a square section of Northwest Douglas County bounded on the north by State Highway 36, on the east by 192nd Street, by Bennington Road on the south and State Highway 31 to the west. The charrette team, led by Tim Mettenbrink of Nebco Inc., included area citizens, planners, land conservation group representatives, developers and a principle property owner (80 acres). You can download a PDF copy of the Conservation Community Charrette Final Report here. The team stressed that the charrette property, a rural site west of Bennington, Nebraska, is not yet ready for development. However, when urban development comes to rural properties such as this, it should be sustainable and preserve the best agricultural and natural areas of the site. The development alternative suggested by this charrette is commonly referred to as a “conservation community,” a compelling antidote to suburban and acreage-type sprawl. 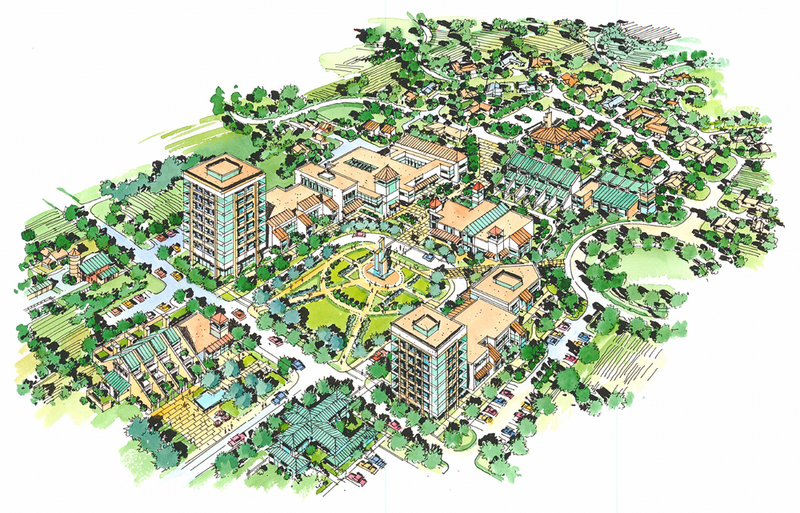 mixed-use development including residential, retail and office. The team identified a number of environmental, social/cultural, technological, economic and public policy objectives in setting up this hypothetical conservation community. Key environmental indicators included the importance of preserving contiguous open spaces such as natural features, organic farmland and low impact landscaping. At least fifty percent of the overall property would be dedicated to preserving trees, creeks, slopes and other natural/topographical features. Natural areas would be enhanced through connections and extensions to other natural or open areas. An organic farming operation integrated into the plan would be capable of feeding the intended population. Important social/cultural factors would include a diverse population and a mixed-use development (residential, retail and office blended together). Population areas would offer a variety of housing opportunities, employment potential for local residents (an environment attractive to office users), and an elementary school and other early childhood development facilities. Technological aspects of the site include the use of appropriate organic, sustainable agricultural practices, renewable energy resources and LEED green building/design practices. To be successful, the prospective developer would need to utilize portions of the open space for alternative energy generation (i.e. wind), ensure that the farm is well maintained and attractive, integrate a learning component in the farm and in a community garden, and provide for transit alternatives. Overall, the conduct of the farm and garden operations and their connection to the resident population would serve as an important learning tools in modeling a food-based community. Economic indicators for the site include diverse housing choices, a local outlet for farm products, and an cost-effective tax strategy. Housing units (single and multi family in a range of price options), arranged in clusters near retail and other uses, would be desirable for their mixed use convenience and “town square” aesthetic. Mixed-use development would enable lower-cost construction and a greater variety of choice within a smaller area. It is important to insure that open space be maintained as lower taxed property. open up to public review guided by Intent and Principles.